Snapdragons provide annual color to the flower garden. Each flower spike has multiple blooms that resemble the head of a dragon when examined closely. 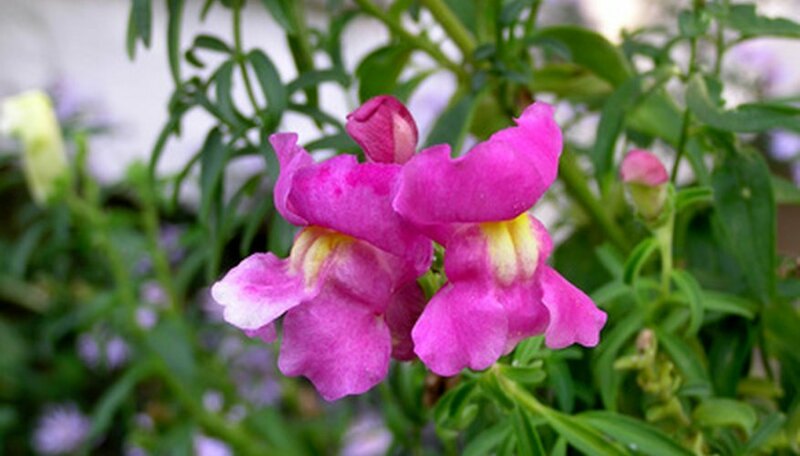 When the flowers are gently pried open then released, the blossom's "jaw" snaps shut, earning the snapdragon its name. Snapdragons bloom best in the cool periods of spring and fall, but can thrive throughout summer if light shade is provided. Snapdragon seeds may be slow to germinate, so start them indoors approximately two months before the last expected spring frost. Fill a seed-starting flat with a moistened, fine-textured potting medium such as a peat- or vermiculite-based soil mix. Avoid potting mixes that are pretreated with fertilizers. Sprinkle the snapdragon seeds on the soil surface, sowing approximately one seed per square inch. Press the seeds lightly against the soil surface but do not cover them, because some snapdragon varieties require light to germinate. Place the flat inside a plastic bag, which retains the moisture in the soil mix during sprouting. Set the flat in a 64 to 68 degree F room that receives bright, indirect light. Remove the plastic bag once the seeds germinate and sprouts appear, which may take up to three weeks. Move the flat to a warm, sunny window and water when the soil surface begins to feel dry. Thin the seedlings once they grow in their second set of leaves. Pluck out the extra seedlings so that there is approximately one plant per every 2 square inches in the flat. Transplant the snapdragons outside once they grow in their third set of leaves. Plant them in the garden at the same depth they were growing at in the flat. Snapdragons are frost-tolerant. Plant them outside in spring approximately one to two weeks before the last expected frost. Snapdragons do not germinate in soils that are too cold or too warm. Use a seedling heat mat if you do not have a space that provides the proper germination temperature.